So you want to print colorful, durable labels in-house in order to save money? I wish I had better news for you at this time. Here we are approaching 2017, and while there have been a plethora of new printer model offerings, new companies, and data that points to exponential growth for in-house color label printing, the challenges continue to remain the same. Laser technology and ink jet technology have been duking it out, but it appears ink jet has finally won for color label printing. Full color laser based printers have been discontinued by several manufacturers including Xante and Afinia. Those who were printing narrow labels found out first that fusers were burning out too frequently. Apparently laser is designed for printing pages, or at least labels close to 8” wide. While the resolution with laser doesn’t approach that of ink jet, it was still suitable for most non-photo quality applications. I had a preference for laser based systems, based solely on the label media cost; laser media (paper or polyester) on average cost 20% less than comparable ink jet media. The heat from laser based printers was a show stopper for applications requiring printing on polypropylene—perhaps the most common media printed today. Most Polypro film is typically good to 150F before it begins to melt. A lot of callers want to print on clear labels that will adhere to bottles. The clear film provides that desired invisible label look, or old fashioned silkscreen onto the bottle look. The film also conforms to round surfaces better, is more moisture resistant than paper, and is priced economically. Clear labels printed on laser based printers would require expensive polyester film. This is overkill for most food and beverage applications, but the durability of polyester is a must for other applications such as GHS, UL recognized, and outdoor use. By now, many in the label industry had expected a wider variety of materials. Ink jet paper has still not been commoditized yet. The hippopotamus in the closet is the ink jet topcoating. This topcoating is what allows the ink to dry at a fast rate. So, when we talk of durable ink jet labels, my concern lies with the topcoatings on the label media. The inks are more durable than ever nowadays. Even the waterbased mem jet ink is durable on topcoated medias. But the most durable is Epson’s pigmented inks. They even boast to be able to print on non-topcoated media. The ink is durable, but for high quality graphics, and rich black areas, you will start to realize the trade-offs. So, even if we print labels with a highly durable pigmented ink, what happens when the label gets wet, and the topcoating gets soggy for a bit? Well, I am able to throw some water on a label, then scratch off the entire coating where it is wet. What’s printed on top of that coating no longer matters. This is why I am surprised at the materials I have tested that are, apparently, BS5609 approved. They are approved for salt water, and large steel drums bobbing and bumping in the ocean? Many learn that full color ink jet and durable labels may not be as viable as it seemed. The final option then becomes the laminated label option. For those printing thousands of labels, manual laminating each label isn’t viable. So the typical system prints labels on a (wider, say 8”) high resolution ink jet printer, along with sensing bars along an edge of the rolled media. The media rolls are then mounted onto a label finisher that laminates a clear polypro film to the label material, then with the sensor marks as a guide, a cutting die, laser, or digital knife, cuts each label shape, down to the backing liner, and the matrix (waste) is stripped away. The rolls with multiple labels across can then be slit down to single rolls, and then placed onto label affixing equipment. Do companies want to get involved with label finishing equipment? 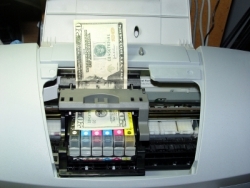 The investment to consider would be approximately $40K for a printer and finishing system, then the time to allocate to running and maintaining the equipment. Stay tuned for further developments in durable ink-jet label media options. In the meantime, feel free to contact George Righter directly with your label printing inquiry today.